I came across an unusual cockroach while visiting a greenhouse last week in southwest Ohio. 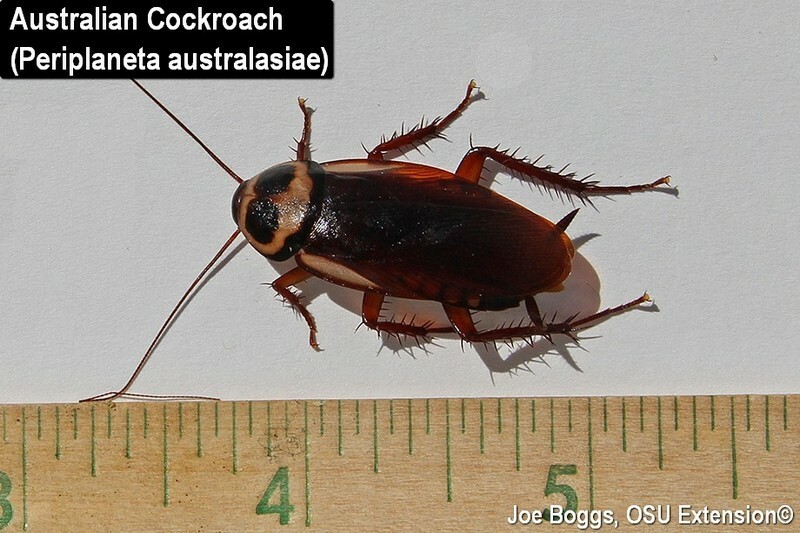 The Australian Cockroach (Periplaneta australasiae) is a tropical species that will feed on and damage plants; they do not confine their appetites to the "normal" table fare associated with cockroaches found in Ohio. Indeed, I spoke to a former IPM specialist for an eastern conservatory who told me they suffered significant losses of seedlings and rooted cuttings from these cockroaches. The common name and specific epithet for this cockroach are misnomers because it's now widely accepted that these cockroaches probably originated in tropical Africa but were accidently transported to Australia where they were first described and named. They have also become established in several southern U.S. states including Florida where they are now one of the most common species of cockroach found outdoors. Indeed, the Australian cockroach is considered "peridomestic." These are animal pests that primarily live outdoors but occasionally find their way indoors; Norway rats (Rattus norvegicus) are a good example. The American Cockroach (P. americana) is another peridomestic pest; it thrives outdoors in Florida where it's frequently misidentified as the "Palmetto Bug," but can also live as a serious pest indoors. Of course, the "Palmetto Bug" common name is more correctly applied to the Florida Woods Cockroach (Eurycotis floridana) which only lives outdoors; that's the problem with common names. The Pennsylvania Wood Cockroach (Parcoblatta pennsylvanica) also lives outdoors in Ohio and a number of other northern states where it feeds on decaying organic matter. This big cockroach is an accidental home invader since it can't make a living inside our homes. Australian cockroaches share other qualities with American cockroaches which is not surprising since they belong to the same genus. Despite their common name and specific epithet, American cockroaches are also not native to the Americas; they originated in Africa. American and Australian are similar in size (they're big! ), shape, and they are similar in color. In fact, the adults are difficult to tell apart. The flat, plate-like structure just behind the head of a cockroach is called the "prothoracic shield." The two "eye-like" markings on the prothoracic shields of Australian cockroaches are typically dark brown; they tend to be light brown to tan and less distinct on American cockroaches. Australian cockroaches have light tan to yellowish-brown "shoulders." These markings are at the front of the outer edge of their front wings. Australian cockroach nymphs have distinct and obvious markings. Early instars have black and white bands and later instars have mottled yellow markings. American cockroach nymphs are solid colored. One of the biggest difference between the two cockroaches is the penchant for Australian cockroaches to feed on plants. American cockroaches are not known for this potentially destructive behavior. Several years ago, I was involved with helping to eliminate a Surinam Cockroach (Pycnoscelus surinamensis) infestation in planters in a shopping mall in Greater Cincinnati. This is another tropical, plant-feeding cockroach; however, Surinams are burrowers and mostly feed on plant roots. Australian cockroaches may be found in plant canopies and they are good flyers. The good news is that neither Australian nor Surinam cockroaches can survive the winter outdoors in Ohio. The bad news is that they can live outdoors in the summer and they can be moved about in infested plants year round. And, both can rapidly build damaging populations in greenhouses, conservatories, and possibly interior plantscapes including house plants. Like most cockroaches, Australian cockroaches are nocturnal. The same sticky traps used to monitor for our "standard" cockroaches in Ohio are effective in capturing Australian cockroaches for identification. The cockroaches hide during the day. Closely inspecting plants may reveal both adults and nymphs in their daytime hiding sites. Plants held outdoors in the summer should also be examined. Australian cockroach management involves a possible nexus between four different Ohio commercial pesticide applicator licenses and the associated labeled products. So, one size does not fit all. When we think of cockroach management, we generally think of "Category 10a – General Pest Control" which encompasses "domestic, institutional, structural, and health related pest control." Indeed, Australian cockroaches may be found hiding out in the same structural locations as other cockroaches requiring the license and appropriate products labeled for those sites. However, if the cockroaches are found in a greenhouse, obviously "Category 6d - Greenhouse Pest Control" comes into play along with the products labeled for the site. If the cockroaches are found in interior plantscapes such as a shopping mall, it's "Category 6b - Interior Plantscape." Conservatories are in between; either 6b or 6d are applicable. Find adults and nymphs outdoors? It's "6a - General Ornamental Pest Control." The bottom line is that successfully managing Australian and Surinam cockroaches is not a straight forward endeavor. It will no doubt require both the expertise and applicator licensing associated with a range of different pest management professions that is seldom seen with other plant pests. Of course, as with any pest management challenge; addressing the issue quickly is key to an effective outcome. This is a very good reason for monitoring and properly identifying any cockroaches you see scurrying across plant benches or floors!